A few days ago my friend Mark Goldenberg called up out of the blue and wanted to come by and play some guitars. 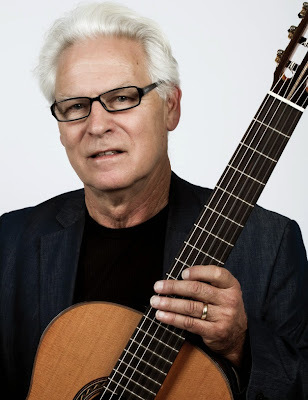 Mark is an elite, well respected multi-style guitarist who lives in the LA area, and has been doing studio work for decades, as well as spending years on the road with Jackson Browne, Hugh Laurie and many other top shelf musicians. So Mark popped in and he and I spent a few hours both hanging around the shop and playing some guitars, and he went home with a new Performance model guitar. He knows what he likes and has no problem making decisions, and he plays beautifully and knows how to get to the heart of the guitar. Mark is a teaching staff member of Peghead Nation, and Teja Gerken is one of the leaders of this innovative online music site. Teja and company put together this feature video just this week and I love it. The text is spot on and the video is articulate and sounds beautiful. I really appreciate the effort and insight that went into this feature. Please check out this link, Peghead Nation: Hill Performance Video Review Nice work! Kenny Hill is to accept the 2015 Industry Leadership Award at this years GFA Convention in Oklahoma City! Go read his Bio here on the GFA Website. He will be accepting this award during the awards ceremony at 9pm on the last day of the convention, Sunday 6/28. Apart from this acceptance he will also be giving a lecture on Thursday 6/25 that you won't want to miss! This year Classical Guitar Magazine has come to the USA in a whole new style. This venerable magazine has been published in England every month since 1982! Then, just this year, my good friend David Lusterman acquired it from the founder, Maurice Summerfield. 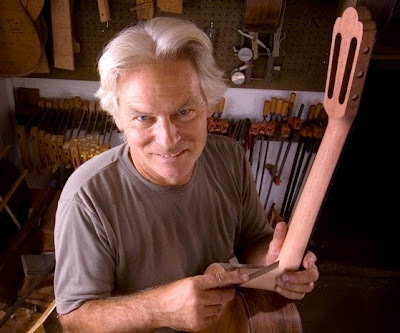 Lusterman has been publishing Strings, Acoustic Guitar, and Ukulele magazines here in the San Francisco Bay area for eons, and there is no one anywhere more capable or more amiable to take over the publication of CG. Classical Guitar will be published quarterly. The first issue recently came out, Spring 2015. I'm impressed. It has a whole new look and editorial style, and I find it engaging and surprisingly broad in its range and depth of relevant content. It has a real sense of both old and new, European and American resources and interesting things from around the world. I am honored to have a feature article in this first issue, and I hope to have a long and interesting relationship with the people at Classical Guitar. I encourage you to look at the magazine and to subscribe to it. This is a great addition to the guitar community, and a wonderful way to stay abreast of artists, trends, old friends and new. I'm really excited to have this new resource coming so elegantly out of our community here near my home. I congratulate David Lusterman and his staff for making this bold and confident move, and showing up with real class from the beginning. New World Guitar Introduces the Ported Player! For over a decade Player traditional classical guitars have made New World Guitars a reasonably-priced high-quality brand. During that same time, Hill Guitars have been built with a variety of modern features designed to maximize the instruments' potential. We've found the addition of 2 holes in the guitar's shoulders increases the air flow in and out of the body providing the player with more accurate monitoring as well as greater quality and quantity of projection for the listener. Now, we've added this option for New World Player owners as an additional step up in quality. 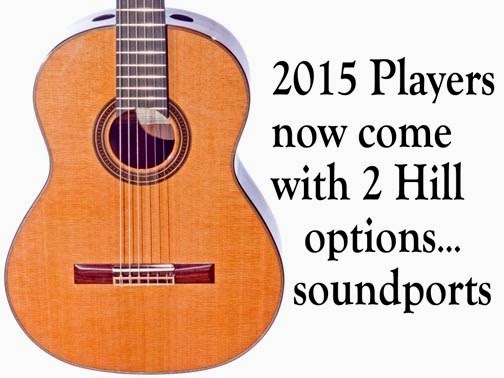 So, try a ported Player and discover how much more there can be to a guitar.